Coventina - Goddess of Sacred Waters - Celtic Goddess. Coventina was a goddess of wells and springs she represented abundance inspiration and prophecy. Coventina was a goddess of wells and springs, she represented abundance, inspiration, and prophecy. She is depicted in triple form or as a water nymph on a leaf, pouring water from a vessel. Votive offerings to Coventina include coins, brooches, rings, pins, glassware, and pottery. Little is known of Coventina other than that she was a purely local British goddess of some importance. She is best observed from the period of the Roman occupation, at which time she shows a classical influence but is clearly Celtic in origin. On one bas relief found at Carrawburgh (near Hadrian's Wall) her name is associated with three nymphs holding vessels with issuing streams of water; on another she is pictured as a water nymph on a leaf, pouring water from a vessel. It is known that she was looked upon as the queen of river Goddesses, particularly of the watershed where the Celtic believe the power of the river deity could be seen and its energy most keenly felt. She was most closely associated with England's Caldew River. Like other river deities, she represented abundance, inspiration, and prophecy. The coins offered to her appear to be sacrifices made in the hopes of sympathetic magick in which like attracts like. In Scotland she was also the Goddess of featherless flying creatures which may have represented some type of blockage to passing into the Otherworld. 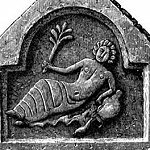 There is also evidence of her having been worshipped in Celtic Gaul where relief's have been found depicting her reclining on a floating leaf. She apparently had high status, and is referred to in inscriptions as "Augusta" and "Sancta." Coventina is usually portrayed as a water nymph, naked and reclining on lapping waves. She holds a water lily, and in one depiction is shown in triplicate pouring water from a beaker.